RECOMMENDED: The Négociant 2009 Riesling, California. 13.5% ABV, $14.99. This is a delicious, off-dry (slightly sweet) version of Riesling. Soft and silky in the mouth. Pears; delicious tropical fruits; lemon finish. Refreshing, beautifully balanced between acidity and sweetness. 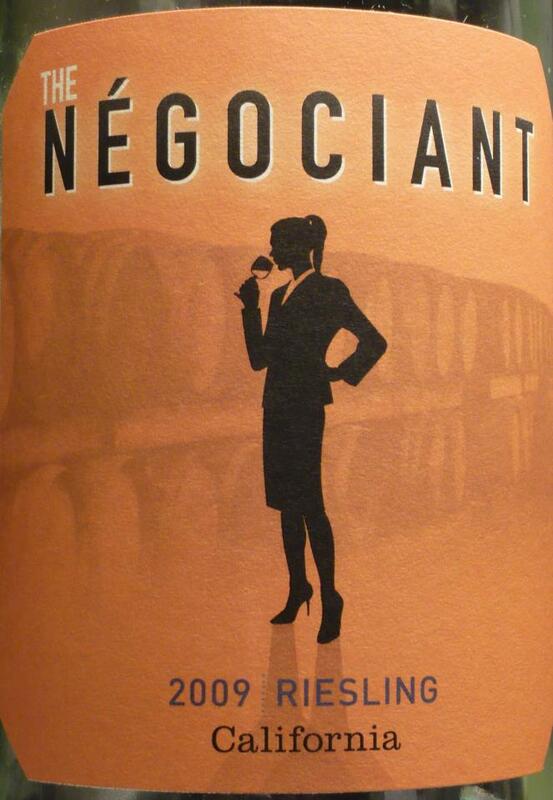 LABEL NOTES: The Négociant is a woman of mystery and sophistication: she knows what she wants and how to get it. She is a jet-setter, judiciously honing her wine knowledge by traveling the world and learning from only the most famed winemakers. Like the many négociants before her, she assembles only the best lots from small growers and sells them under this label. Enjoy this wine while knowing she continues to strive for perfection in a glass. 2 Responses to RECOMMENDED: The Négociant 2009 Riesling, California. 13.5% ABV, $14.99. I have a customer looking for this wine, but can’t find who the distributor is – do you know? Evelyn, I don’t know! The wine is indeed rather shrouded in mystery. I spent quite a bit of time looking for information online and didn’t turn up anything. We picked it up at a Fresh Market store if memory serves (might have also been at the ABC store). Please let me know if you find the information you’re looking for — I’m curious too!